We are bullish on the prospects of Finolex cables as it has put up fabulous results and we foresee it breaking out of its consolidation range. Finolex Cables is showing a strong development within a rising trend channel and thus its move in the positive territory continues above the level of 66 which is a stiff resistance level. 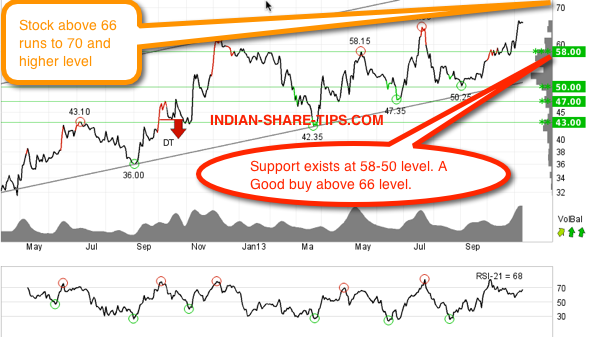 As you can see in the below chart that stock is enjoying a rising support at 58-50 level. Analysis of chart from a technical perspective shows that the volume tops and volume bottoms correspond well with tops and bottoms in the price. This strengthens the trend. The stock is overall assessed as technically positive for the short term and medium long term. The stock can touch 100 levels in a matter of 90 trading days and can touch 160 level in total 150 days. Our clients are long in the stock and one can get fabulous returns by short term picks where holding period is generally 5-8 days and one can get daily profit in intraday trading by using the best intraday hot stock of the day and be out of the market with profit by 11:30 AM.